You rely on your dive torch on more than just night dives. It can also come in handy when trying to spot marine critters hiding under rocks and ledges, especially when hunting for crays and abalone. Looking after it properly is key to ensuring its lifespan. Torch maintenance is simpler than most of us might think. However, if neglected, dive lights will fail during your dive, and in some cases, the warranty offered by the dive light manufacturer may be voided if a torch is faulty due to negligence when it comes to cleaning and repairs. To make sure you know how to properly care for your dive light, we've put together these simple maintenance tips. Open the light to inspect all O-rings for damage. Clean and lubricate O-rings with silicone grease. Install a properly charged battery and check operation. Inspect for damage or corrosion on the light, switch and body. Check the lanyard or mount for damage or corrosion. Rinse thoroughly in fresh (preferably warm) water to remove all salt or sand. Soaking it in a warm water bath the same way you would an underwater camera also helps to remove salt deposits. You should not use a cleaning agent, especially those intended for wet suits and other diving gear. Fresh water is all you need. Operate all switches 5 to 10 times while submerged to work any salt water, debris etc. out of the switches. Dry thoroughly before opening. You should not leave your torch to dry in the sun as this can damage the O-rings. Inspect O-rings for dirt or damage. Whenever you open the torch to replace the batteries, it is paramount to remove the O-rings, inspect them for any damage, and clean off excess grease. Lightly grease the O-rings and replace them if required, ensuring no hair, dust, or grit is attached as these can break the seal. Run a cotton swab into the groove where the O-ring sits to remove grit, sand, and excess grease. DO NOT over-grease the O-rings. Excessive greasing makes it likely the torch will leak/flood. Remove batteries before storing it for a long period — batteries leak when left unused for long periods of time. Only use the battery type recommended by the manufacturer of your torch. Lights with safety certifications list specific brands and models. Try to use high-quality batteries even if it means spending more. Cheaper or low-quality batteries can leak if left inside the torch. Unfortunately all sizes and brands of alkaline batteries can leak corrosive liquid (potassium hydroxide solution) when mishandled or left for months stored in a flashlight. When this occurs the mechanism of the light will probably be damaged and the reflector surface may lose the shiny aluminium coating. Note: if the battery liquid touches your skin, wash it off immediately because it will cause a chemical burn. Store your batteries separately from the light. If you see any green corrosion in the battery compartment, this indicates that the batteries have leaked acid and it is eating away the metal. Red corrosion indicates entry of seawater in the battery compartment, and means that the torch's metal parts are rusting. Most battery manufacturers recommend storing batteries at temperatures between 10°C (50°F) and 25°C (77°F), with relative humidity not exceeding 65 percent. Refrigeration of alkaline batteries is not necessary. Temperatures exceeding 54°C (130°F) should be avoided due to potential softening of the seal in the battery and subsequent leakage. Also, batteries which are installed in an O-ring sealed light without observing the proper polarity, are not the same type, brand name and age, or are completely discharged, can vent hydrogen gas and possibly cause an explosion. To avoid these situations load batteries according to the diagram shown on the light, or in the instructions. Do not mix batteries of different type, brand name or age. Discard all batteries as soon as they are drained, or no longer produce light. Rechargeable NiCad battery packs should be charged before use for maximum burn time. They can self discharge at the rate of 1% per day. Charge the pack 10-12 hours, or until the pack begins to feel warm. Turn the light off when it is dull orange. Do not allow the battery pack to become completely discharged. A battery stored for several months will need to be charged and discharged several time for maximum burn time to return. Always check the main O-ring seal before diving. To do this, open the light and remove the O-ring with you fingers. Do not use any tools which could cut the O-ring or scratch the sealing surfaces. Clean the O-ring by running it between your index finger and thumb until it feels smooth and clean. Wipe the sealing surfaces with a soft lint-free cloth until they appear clean. Grease the O-ring by running it between you thumb and index finger after applying a little O-ring silicone grease. Only shine the O-ring with grease. Excesses of grease are not necessary and do not improve the seal. Carefully replace the O-ring while watching for contaminates such as lint, threads, hairs or sand. Close the light by replacing the bezel. Excessive force is not required when replacing the bezel. Usually a snug twist is all that is required. Fresh batteries or rechargeables just off the charger often have slightly higher voltage than normal. Increased voltage applied to a lamp bulb decreases its life. Most lamps actually fail just after replacing batteries for this reason. In order to reduce this voltage, allow rechargeables to rest for a while after charge (perhaps an hour). Turn the light on and leave it on for a few minutes to reduce the excess voltage. Flicking the light on and off with fresh batteries will certainly reduce the lamp life. When replacing alkaline batteries with lithium batteries lamp life will be shortened due to the slightly higher voltage from the lithium cells. If your light floods with water, turn it off immediately. 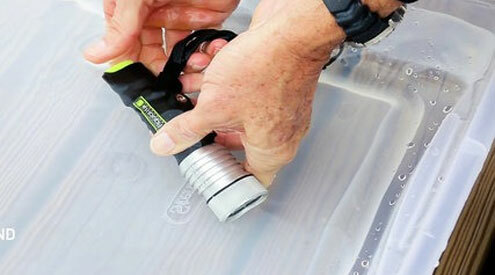 After returning to shore or the dive boat, unscrew the bezel and rinse the contents with fresh water. Allow all components to dry completely. Reassemble the light to see if it still works. If not, return it to your dealer or the manufacturer for repair. Remove the O-ring before shipping. These same tips apply to your backup torch, plus your underwater photographic and video lights and strobes. Follow these guidelines, and your dive light will be a happy, long-term illuminating friend for you! Clear skin and good teeth are fleeting but diving is forever.